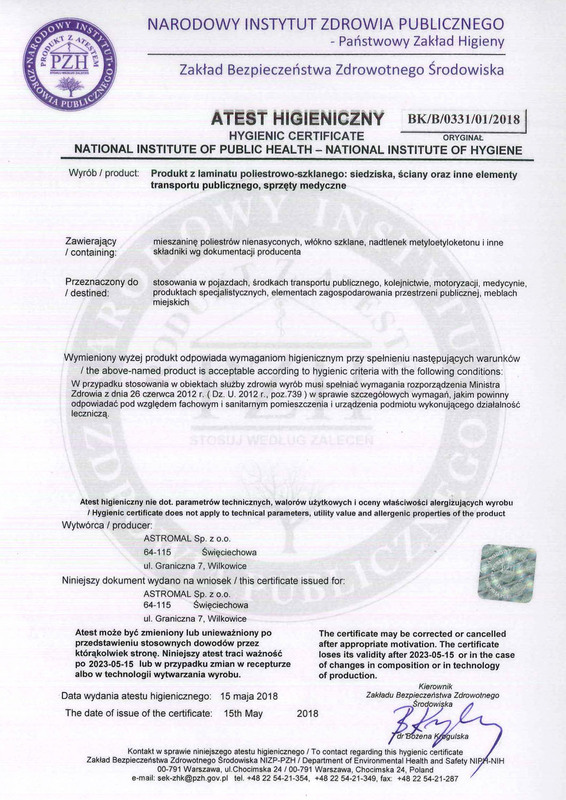 The obtained certifications are confirmation that our processes and products we deliver are of high and stable quality. The desire to have certifications is the foundation for our company’s development. Quality, safety and improvements – we follow the trail over the years widening the circle of satisfied customers. In order to meet high expectations and needs of the market ASTROMAL Sp. z o. o. is firmly and consistently consolidating its strong position among companies that produce fiberglass reinforced goods and passenger seats for public transport. 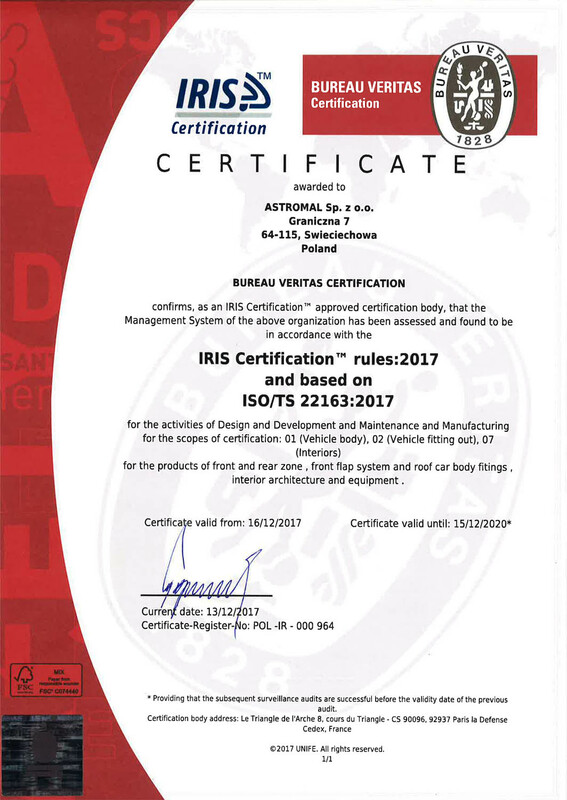 We design, make tools and products, trade, and provide service according to the IMS Policy in this respect. At the beginning of our journey, we set ourselves a number of tasks which we have been developing and performing as meticulously as possible in order to retain ASTROMAL Sp. 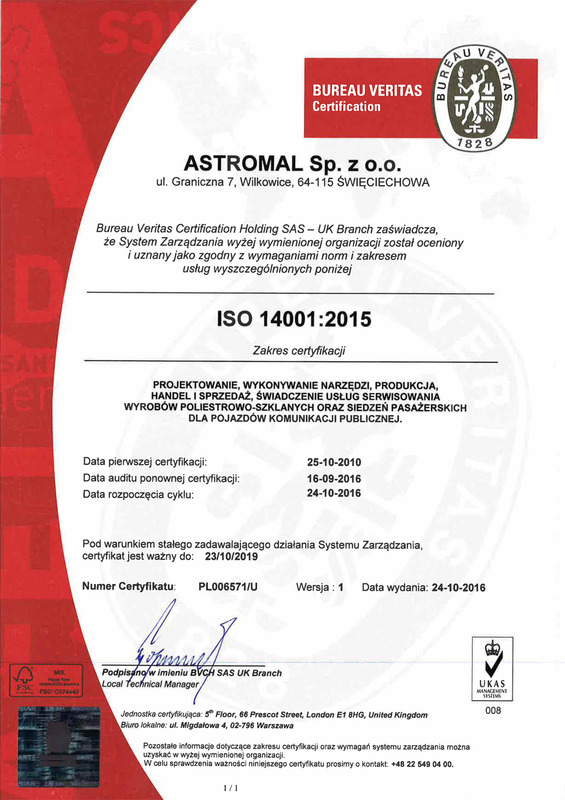 z o. o. status of a trustworthy company, both on the Polish and European market. Satisfaction of our Customers is what is most important for us. We produce highest quality components for industries such as: railway, automotive and medical. We still strive to increase company’s turnover and its competitiveness. We treat our suppliers as partners. We consider it relevant to upgrade our products, processes, and services, as well as to cooperate with acknowledged designers. The main objective of the Board of Directors is to provide customers with comprehensive products and services at the highest level, and thus, provide long-term prospects to employees of the company. In order to achieve that, a strong, trained team and modern technological facilities are necessary. Therefore, it is very important to ensure that the work environment is based on trust, honesty, and mutual respect. We expect good working results, engagement, and efficient exchange of information from our Employees. We strongly believe in the power and efficiency of the team, we appreciate our employees and take into account their needs. We are involved in eco-friendly activities. The organization prevents pollution, minimizes waste generation and is involved in recycling waste. Our priority is to fulfill and comply with legal requirements and other requirements that the organization agreed to meet, as well as those requirements which relate to its environmental aspects. The continuous improvement is also used for the purpose of improving the environmental performance of business. Taking treatments aimed at preventing negative consequences on the environment, the organization regularly sets and revise objectives and environmental tasks with a view to their implementation. The Board of Directors of ASTROMAL Sp. o.o. here declares that it is fully committed to the promotion of the Integrated Management System and any action that with this system arise. The Executive Management is building an organizational culture based on knowledge management. Integrated Management System is subject to constant improvement and updating in line with the development strategy of the company. In line with the general objective concerning the technical security of our goods, we would like to assure our Customers that our company will not accept an order in relation to which there is a doubt that the quality requirements cannot be met. The Board of Directors of ASTROMAL Sp. z o. o. also declares that all of its Employees are aware that the tasks they carry out have an impact on the technical security of products and that they are responsible for these products. seeking to prevent negative effects in case the quality requirements are difficult to meet. We strongly believe that our responsible attitude in this matter and consistent implementation of the above policies will increase the satisfaction of our current customers, and will also attract new ones. Moreover, we believe that it will result in strengthening our market position and economic. Activities, connected with Health and Safety, are the center of our company’s attention; they are part of supporting element of the strategy. They are designed to ensure continuous improvement of working conditions and safety. The intention of ASTROMAL Sp. z o. o. is to make sure every employee and person on the premises of the company is safe. The content of the IMS Policy presented is communicated with all employees and all people working on behalf of the organization. 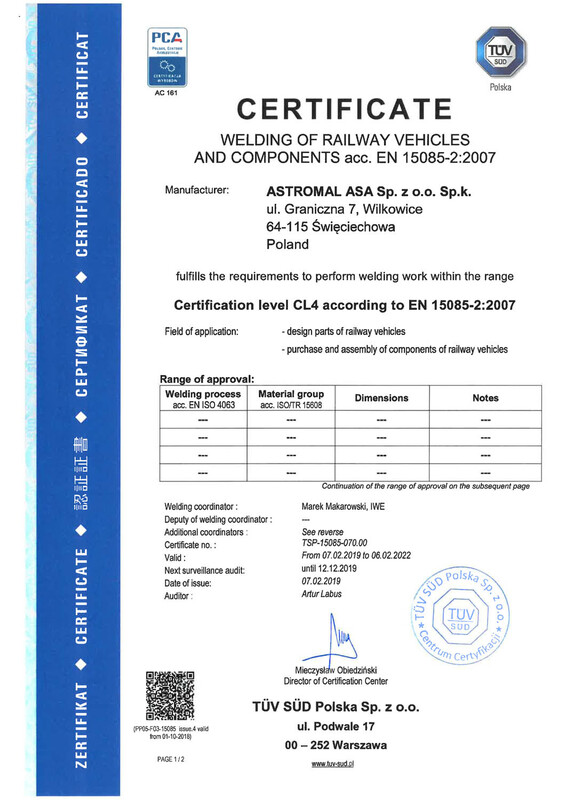 This policy is publicly available online at the company’s website www.astromal.pl. The IMS Policy objectives are periodically checked and verified. 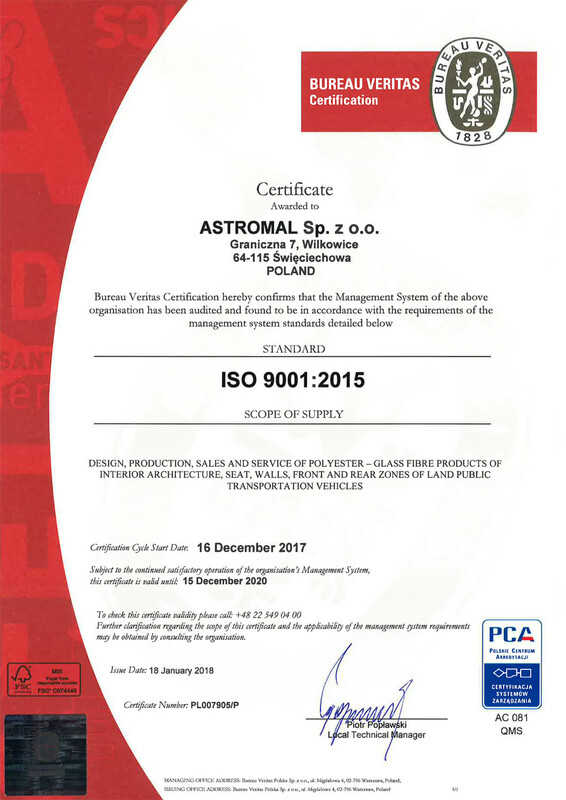 The consistent implementation of the above objectives, professionalism, attention to quality of products and of every detail, and finally our extensive experience make ASTROMAL a very strong and reliable brand in the market, which is trusted by a still increasing number of Customers from all around Europe. AS-KJ-4.2.2-Z03; issue 12; data: 08.11.2017.